A study from the University of Alabama at Birmingham suggests eating a Mediterranean diet may be linked to preserving memory and thinking abilities. 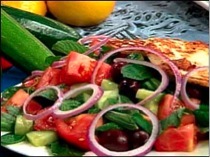 A Mediterranean diet is high in omega-3-rich foods like fish and olive oil. It also includes plenty of fruits, vegetables and grains and is low in saturated fats, meat and dairy.